Core balances feature an innovative stackable design that saves space, so the Core lends itself well to science classrooms or busy labs where multiple devices can be stored away in prep rooms and storage cupboards. The Core includes a convenient weigh-below hook, facilitating below-balance weighing for tasks requiring density and specific gravity measurements. Offering precision results, Core is suitable for weighing compounds in science classrooms, samples at a field lab, ingredients in food labs and specimens at veterinary offices. The Core is an entry-level weighing balance that includes all the necessary functions expected of a school weighing balance. The Core is crafted using durable ABS plastic housing combined with a chemical-resistant stainless steel weighing pan for preventing accidental spills. Multiple machines can be stacked on top of each other and stored in classroom cupboards until required. 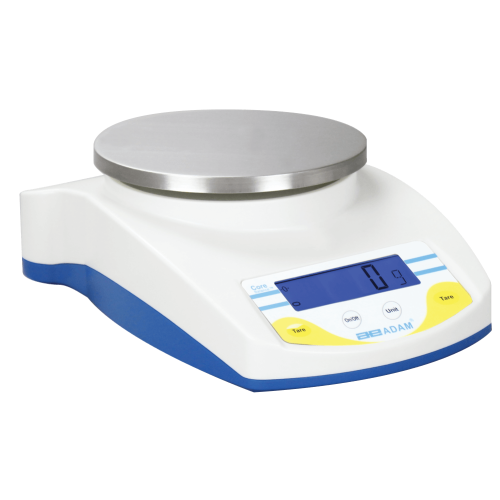 Science laboratories may use standard weighing balances such as the Core to reference weigh chemicals, compounds and other samples. The Core's small size makes it ideal for fitting on busy laboratory workbenches, whilst its lightweight design means that it can be easily transported or moved if necessary. Variations of the Core can often be used for weighing grain and animal feed. The large stainless steel weighing pan allows the balance to be easily cleaned after use.